I have a confession to make. I know You already know all about it, but it helps to say it out loud. Sometimes when I pray those big prayers - You know the ones - where only a miracle from Your hand will do - there is a tiny seed of doubt niggling at my heart. I'm not sure whether it's a lack of faith or a belief that I am not worthy of such a big thing. After all, there are so many others who are suffering just as much, and more, as those I love so dearly. Why should the miracle happen for me? But here's the thing. 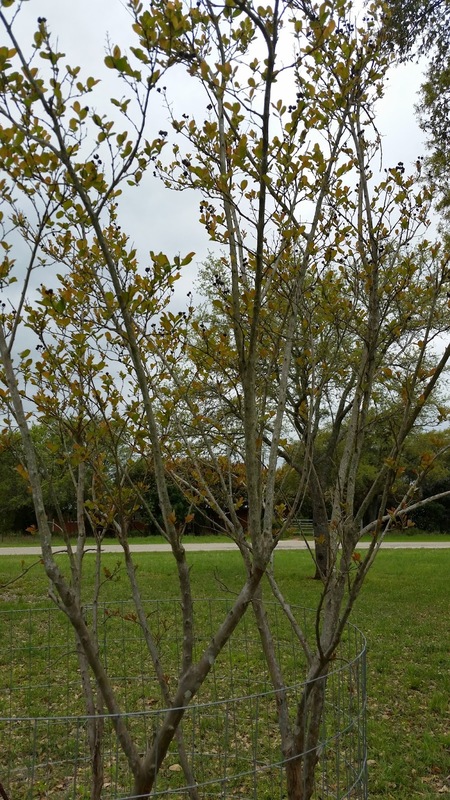 Remember the Crape Myrtle trees we planted when we first moved into the new house three years ago? We took such good care of them. We fed them, put down mulch, watered faithfully in the heat of the summer, and even put fencing around them to protect them from the deer. They started slowly - so slowly, but they were beginning to do well. All five of them had lovely pink blooms last summer. We were so happy. However, we got a little careless. We took down the fencing thinking the trees would be fine. It made cutting the grass and pulling weeds so much easier. All was well until the young bucks in the neighborhood- the four-legged kind - began rubbing their antlers on the trunks. No offense to the young bucks. They were just doing what they're supposed to do. But, oh, the poor trees. By the time I realized what was happening, all of their poor slim trunks were stripped bare. I was heart-sick. The experts all said the trees were doomed. Trees can't live without their bark. With little hope, we put the fencing back up. And I prayed. Sometimes it felt a little silly praying so hard over those trees. But I longed for them to survive. All through the winter I prayed, watched and waited. Spring arrived, and there was no sign of life in any of the five little trees. But suddenly, overnight it seemed, tiny leaves appeared. On every tree! Oh Father - thank You so much. Not just for saving the trees but for encouraging my heart. You've reminded me that You hear every prayer - whether big or small. And really - this is a miracle. Against all odds - they lived. Linda, this reminds me of some prayers I've said, and lots of times I've said, "Oh thank you. God! I knew you would!" I'm keeping my fingers crossed that deer won't eat my lilies; maybe I should pray?